← The 10 best sales and marketing books. Why sales contests don’t work. Legend has it that Medieval England’s King John once stated, “If I bestow Knighthood on one of my Lords, one man becomes a faithful follower, and one hundred Lords would put a dagger in my back.” Similarly, sales contests too often make one salesperson a happy hero, and disillusion the rest. While it’s fine to recognize and reward sales accomplishments, setting up competitions to create winners and losers in a sales team are likely to do more damage than good. Agree or disagree in the comments section below. Your thoughts on rewarding sales performance? 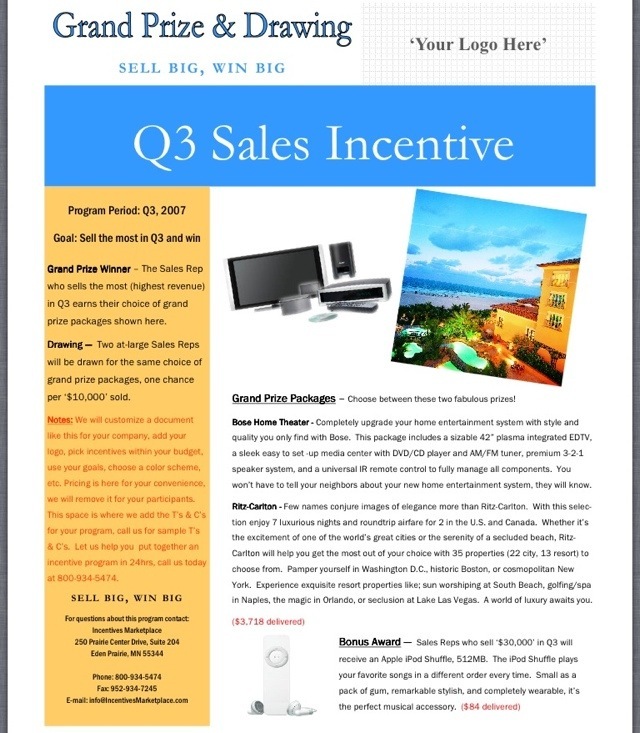 This entry was posted in Business, Management and tagged awards, contests, incentives, sales, sales awards, sales contests, sales incentives, sales management. Bookmark the permalink. 3 Responses to Why sales contests don’t work. Hi Art, I totally agree with you. I believe that we’re attempting, via terribly 1-sided things like sales contests or employee of the month recognition, to provide positive reinforcement to people to bring out their best. These limited focused methods of performance management never really achieve the expected or desired results. To bring out the best in people requires work., It’s not automatic. From the start, sales contests immediately eliminate a number of people from working toward, for them, an unattainable goal. The employee of the month has the same sort of disincentive as does rewarding an entire team for results achieved. Any attempt to bring out the best in people should start with identifying the desired behaviors or those needed to attain desired results. Once the behaviors have been identified, then the current practices need be analyzed to identify behaviors no longer wanted. A good example in the software world is to stop providing rewards or positive reinforcement for fire fighting and begin to provide positive reinforcement for developing software that works properly with no fires to put out. One added benefit to identifying both good and bad behaviors is that employees automatically have a set of expectations that are common for all. There’s no wonderings associated with what to or what not to do throughout one’s day. Once behaviors have been identified, the manager need to touch base with each employee individually to determine what, for each, is a positive reinforcement. For example, for some getting up in front of 100 people to receive accolades for a job well done can be positive whereas for others it could be a big honking punishment. During these manager/employee dialogues, both good and bad behaviors should be discussed. After each discussion. the manager needs to be aware of the efforts of each employee to discern whether or not the desired behaviors are being adopted or followed while unwanted behaviors are fading away. The final step is to provide positive reinforcement, to all, for doing desired behaviors and applying consequences to those engaging in unwanted behaviors. An alternative to the consequence approach is extinction. Rather than making a big deal of something, nothing at all is said or done. Eventually extinction should result in unwanted behaviors fading away because people like to receive kudos for a job well done. These kudos can be as simple as a day off or recognition in front of the team. Oh, rewarding a team will result in rampant mediocrity because the top performers will see that those doing a less than adequate job will get the same positive reinforcement as those who worked their tails off. These top performers will tend to slack off because, after all, why work their tails off to get the kudos when others work far less and get the same rewards. Sorry, this didn’t start out being so long. It just flowed….. I know. It’s easy sometimes to just get on a roll. Thanks for your thoughtful comments. Happy to. I actually spent years going to meetings fully intending to quietly keep my mouth shut. I always failed. The problem I ran into was that if there was something I disagreed with, maintaining silence was the same as lending tacit agreement to it and I couldn’t do that.